8.10.10 IS ANYBODY THERE? : John Crowley 2008 Drama 1980s seaside England, Edward is an unusual ten year old boy growing up in an old people's home run by his parents. Increasingly obsessed with ghosts and the afterlife, Edward's is a rather lonely existence until he meets Clarence, the latest recruit to the home, a retired magician with a liberating streak of anarchy. 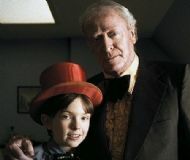 This is the surprising, touching story of an odd couple - a boy and an old man- facing life together. Carried over from last season, entry will be free to 2009/2010 members, if you weren't a member last year but still want to see the film there will be a one night membership charge. Yôjirô Takita2008 Drama/Music Elegiac and beautifully filmed as befits the story of an unemployed Tokyo cellist who accidentally finds himself performing traditional funeral rites. Generally despised as an occupation, even by his wife, he brings the same respect to his new occupation as he does to his beloved music. 5.11.10 TEN: Abbas Kiarostami 2002 Drama This acclaimed Iranian film focuses on ten conversations between a female driver in Tehran and the passengers in her car. Her exchanges with her young son, a jilted bride, a prostitute, a woman on her way to prayer and others, shed light on the lives and emotions of these women whose voices are seldom heard. 26.11.10 NOWHERE BOY: Sam Taylor-Wood 2009 Biography/Drama. A well acted, well presented portrait of a young man’s formation, conscious of the force John Lennon (for it is he) will become, but never letting that swamp the story of how his unconventional upbringing would lead him, with Paul and George, to form the biggest band in the world. 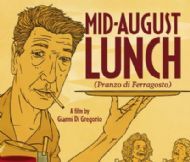 Director and star Di Gregorio plays a middle aged man devoted to his 93 year old mum and putting up with her three dotty friends over the mid-August holiday. 4.2.11 I SERVED THE KING OF ENGLAND: (Obsluhoval jsem anglického krále) Jiri Menzel 2006 comedy/drama. Wonderfully absurd and full of humour this is the story of a young Czech waiter ambitious to own a smart hotel. He lives through the Nazi occupation, can he survive the Communists? 18.3.11 SULLIVAN'S TRAVELS: Preston Sturges 1941 Drama/Comedy/Romance: As brilliant and funny today as it was in the 40’s Sullivan’s Travels is the story of a spoiled, pampered film director who decides to make a socially relevant film highlighting the plight of the poor. When it’s pointed out that he actually knows nothing about the plight of the poor he decides to go on the road to find out for himself. The laughs are never far away in this classic movie but it treats the struggling masses with dignity and respect and Sullivan gets more than he bargained for on his travels. Films are screened upstairs at the County Hotel, High Street, Selkirk. The County is the perfect place for a pre-film meal and a post-film drink and a blether. Doors open at 7.30, programme usually starts at 8.00 with an interesting short film. Membership fees are £24/£18 at the start of the season for six films reducing pro-rata as the season progresses and £5/£4 for day membership (concessions for students/unwaged). So, if you join at the start of the season it works out at £3 per film. Members are entitled to vote for films which will make up the season's viewing and attend the AGM.